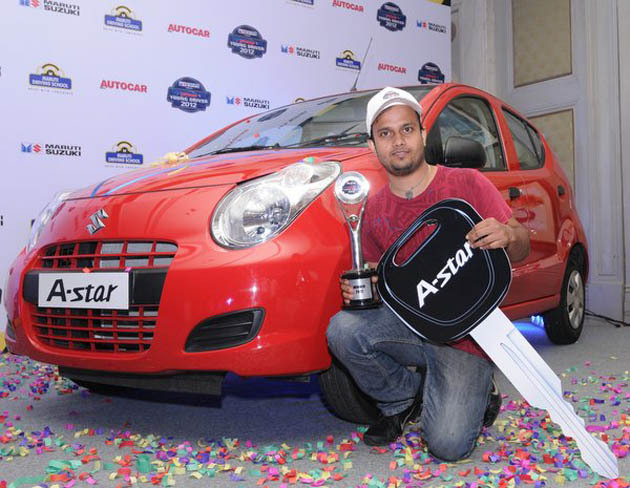 In the 4th season of hunt for the nation’s safest young driver, Maruti Suzuki Auto Car Young Driver Contest, Kolkata’s Sudeep Ranjan Mishra cleared his way to win the contest. He has been awarded with a brand new A-Star and endorsement for the company’s events promoting safe driving. The top-three finishers of the contest had two Kolkatans. Apart from Sudeep, it was Mudit Agarwal from the City of Joy, who finished the contest being the second runners-up. Visakh Susan Vincent from Kochi had to console himself with the first runners-up spot. On the other hand, Mumbaikar Srushty Parsana emerged as the clear winner in the women category. The contest, advocating participants’ knowledge of traffic rules, awareness of road safety along with their real-world driving skills, witnessed participation of around 21,000 young enthusiasts (in the age group of 18-30 and with valid driving license) from over 65 cities across the nation. The automaker has been the godfather of promotions of road safety and safe driving habits over a decade now. Way back in 2000, it was the first time that Maruti Suzuki took such a step forward (read, safe driving concept) by inducing focus on international best practices, international curricula and managerial expertise to run and manage institutes like IDTRs and Maruti Driving Schools. Following such intentions (of the concept) and setting up of special teams for the same, the company went under a partnership with Delhi Government to ensure establishment of international practices and set ups (like Simulator for training). The company took the safe driving concept to the next level when it brought in the concept of Maruti Suzuki Auto Car Young Driver Contest in 2009 for the first time. As far as the Institute of Driving Training and Research (IDTR) is concerned, the nation currently has six IDTRs (2 each in Delhi & Haryana and one each in Gujarat & Uttarakhand). The first IDTR was opened in Delhi in 2000. On the other hand, Maruti Driving Schools are actually a mutual effort by the automaker with its dealers to ensure that middle class families in the urban neighborhood (of the dealers) can learn driving.